Dental Bridge Cost - Why So Expensive? If you have just got a quote for dental bridge cost, you might be surprised at how expensive it is. The cost of a dental bridge is made up of several factors. They ALL have a bearing on dental bridge cost. But first, I want to make it clear that I am talking about a FIXED DENTAL BRIDGE. This the opposite of a removable dental bridge! A fixed dental bridge is one that is fixed in place; the “new” tooth is held in place by a cap on the teeth on either side of the gap. It is fitted to your teeth with dental cement, and you cannot take it out. So it stays in place, and should feel almost like having your own tooth back again. The opposite is a removable dental bridge, which is a replacement tooth that you can take out yourself at home. It’s NOT fixed in position securely, like a fixed dental bridge. Which is better? Which is more expensive? Which one is best value? In most situations a fixed dental bridge will be better than a removable bridge, but it will also be more expensive. 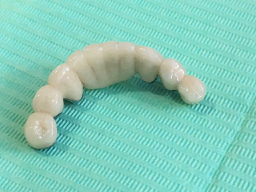 However most patients will say it's better value, because it feels much more like a natural tooth, and it will usually last much longer than a removable bridge - sometimes over 20 years. This page is about fixed dental bridge cost. So we are looking at the cost of a dental bridge that is FIXED in position. It’s in there with dental cement - you can’t take it out, and nor can your dentist, without a significant risk of breaking the bridge. The cost of a dental bridge will usually range from $500 to $1000 per tooth on the bridge. 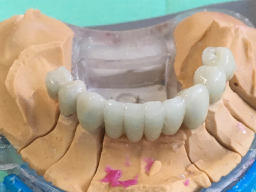 This means that a bridge to replace ONE tooth, which normally has a crown (or a “cap”) on either side of the replacement tooth (in order to anchor the bridge in) will actually have THREE teeth on the bridge in total. The cost in total will therefore range from $1,500 to $3,000 for the complete bridge. Of course, if you have 2 or 3 teeth missing, then the cost of a dental bridge will be higher. 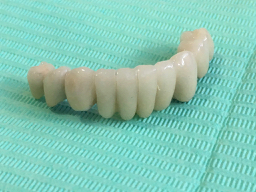 If you have 3 teeth missing that you want to replace, then you are looking at a 6 unit bridge as a minimum. This is because the number of teeth (or “units”) on the bridge is always made up of the number of missing teeth to be replaced PLUS the number of teeth that have to be capped to hold the bridge in place. We always want the number of missing teeth to be replaced to be smaller than the number of caps on the bridge, or at least equal in number. This is because we are asking (for example) three natural teeth on a six-unit bridge to carry the biting forces for a total of six teeth. That’s double the load! And that is the MAXIMUM loading that we can get away with. Here is a series of photos of a LONG bridge that I did recently. 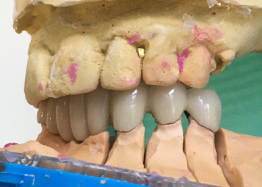 The first photos show you the dental bridge from the front and from the “inside”; the next photos show the fitting side of the bridge - you can see which teeth on the bridge are caps (they are hollow) and which are replacements for missing teeth (they are solid teeth on the bridge). The final photos show the bridge on the laboratory models. 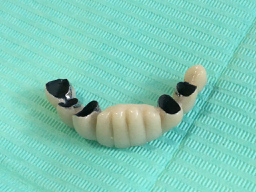 As you can see, this is a TEN unit bridge, with FIVE replacement teeth and FIVE caps to hold it in place on the remaining natural teeth. 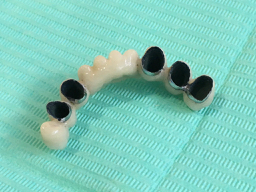 This dental bridge cost the patient around $5,000, here in Spain. In the USA, it would be more expensive than this, in most dental offices. So dental bridge cost is mainly dictated by HOW MANY TEETH in total there are on the bridge. The other important factors are where you live and which dentist you see. Obviously, if you are seeing a big-shot dentist in a major city, the dental bridge cost will be higher than with a more “normal” dentist in a regular-sized town. That’s because it’s simply more expensive to provide the same service in a big city location; the dentist’s costs such as office rental, staff wages and laboratory costs will all be higher than in Smalltown. The other major factor in dental bridge cost is the manufacturing expense in the dental laboratory. The dental lab technicians who create dental bridges are highly trained and talented ladies and gentlemen, and they will charge accordingly for their time and skills. In addition, there is the cost of the gold metal alloys used inside the bridge. With the price of gold going up so much in recent years, overall dental lab costs have increased too. While there ARE gold-free alloys used in dentistry, most labs will still tend to prefer using an alloy that contains some gold, due to the excellent properties of this metal for use in dentistry. I hope this guide to fixed dental bridge cost has been useful. The cost of a dental bridge is rather elastic, but one thing is for sure - a bridge that is cheap is very likely to have a shorter life span than a bridge that is more expensive!